Monday's mixed market was not relative to the overall health of the market. The Dow was down hard at -157 because of nearly 100 points lost by Boeing and Caterpillar on the return of tariff retaliation worries. The S&P was nearly flat and the Nasdaq and Russell 2000 were positive. The tech sector has been leading the market higher and it is still leading. The Russell was up on gains in the chip and biotech sectors. I expect the markets to continue higher and I warned over the weekend there could be some weakness but I expected gains for the week. The tariff worries are overblown. While there may be some retaliation, the actual announced tariffs were much weaker than expected and contained a significant number of exemptions. It could be weeks or even months before we know the eventual outcome. Meanwhile 2018 earnings are projected at 18%, GDP at 3+% and tens of billions in buybacks and dividends. If fundamentals matter, the markets should continue higher. 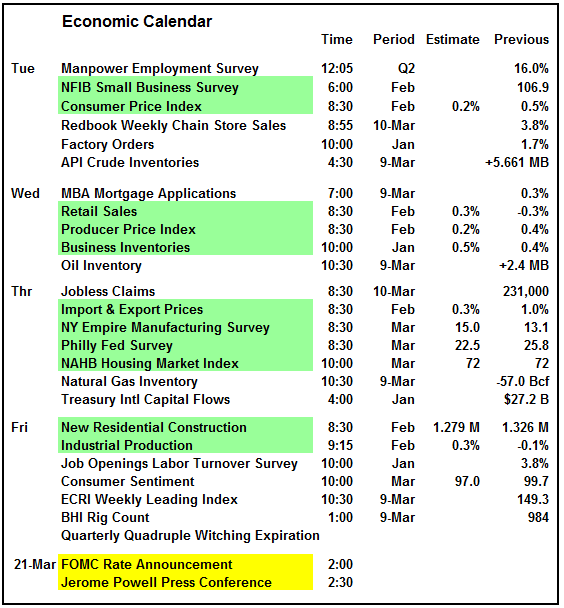 The economic calendar has a lot of reports that should present a mixed picture to the Fed when it meets the following week. This should keep the Fed on its gradual course of three hikes in 2018. However, a couple members have turned slightly more hawkish after the January employment report so it will be interesting to see what they say after the meeting next week. They may have cooled on their hawkish stance. The market typically rallies before a Fed meeting so investors could be taking positions the rest of this week to profit from that bounce. Thursday is the big day for earnings with Adobe, Broadcom and Ulta Beauty. 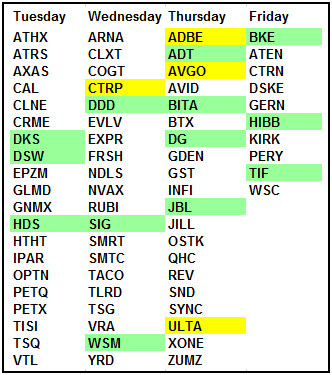 For the next several weeks, there will only be a handful of companies reporting until we get into April and the Q1 cycle begins. 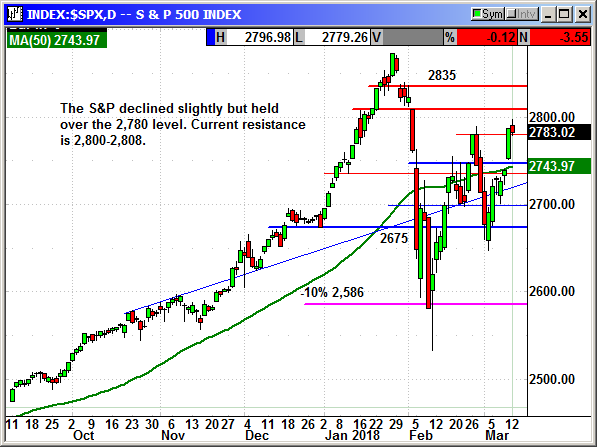 The S&P declined slightly but held over prior resistance at 2,780. Current resistance is 2,800 and support is 2,750-2,743. Without a significant change in market sentiment I would be surprised to see a material decline. Monday was just minor profit taking, settlement from the short squeeze and the return of some tariff worries that will pass. 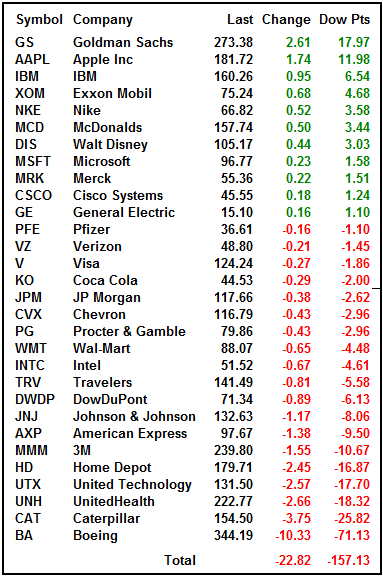 The Dow was handicapped by Boeing and Caterpillar and those stocks forced selling in the Dow ETFs and the SPY. 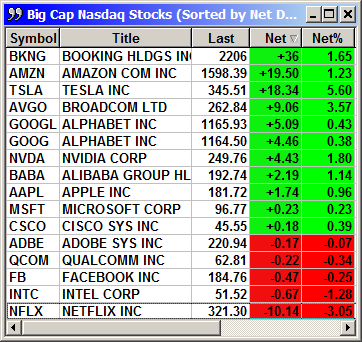 I believe the worry is overblown but that does not mean those stocks cannot decline further. However, there were up strongly on Friday so this was just profit taking and investors exiting because they missed this level on the first drop. Support is 25,000. The Nasdaq set a new record high despite a $10 drop in Netflix. Apple's Eddy Cue said a Netflix acquisition is unlikely and shares declined. I doubt anyone really believed the rumors but they were circulating. Personally, I wish Netflix would drop another $50 so we could buy it again. At $325, the option premiums are out of sight. 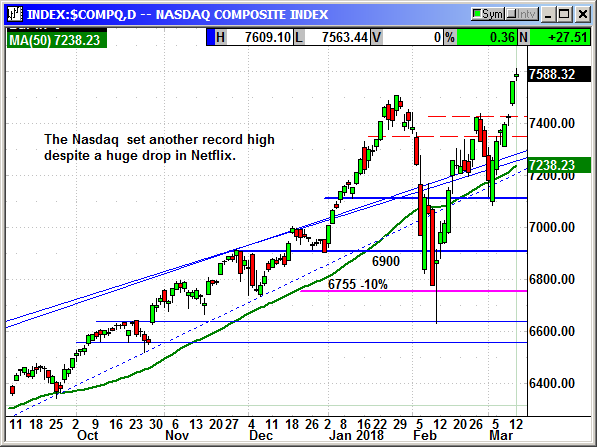 The Nasdaq stretched its gains to 84 points over the prior record high from January 26th. If we had a minor pullback in the tech index, it would be a buying opportunity. 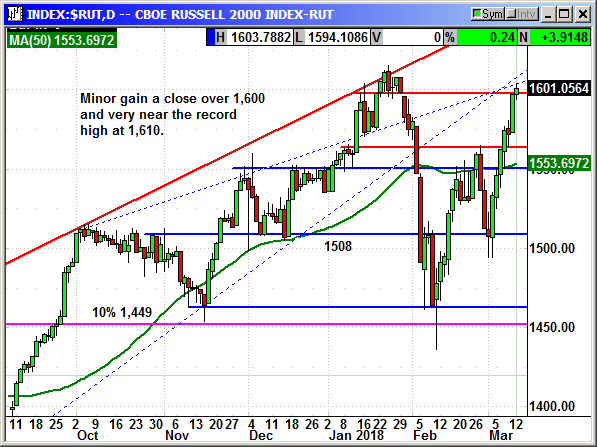 The Russell 2000 eased over the 1,600 mark and only 9 points from a new closing high. 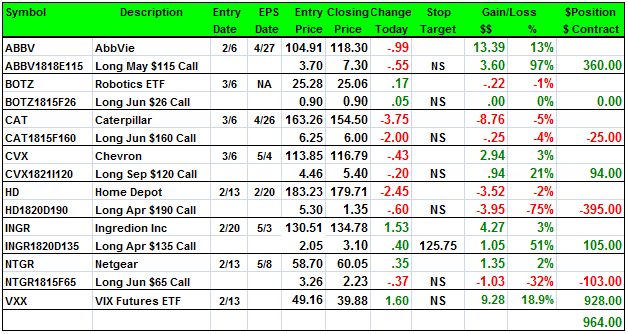 The Russell is rising on strength in chips and biotechs along with the rest of the tech sector. 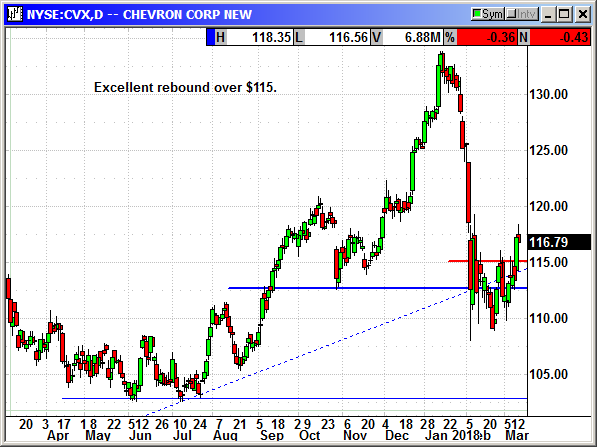 A breakout over 1,610 could set the broader market on fire. Any pullback in the market from this level would be a buying opportunity The fundamentals are so strong they should overpower any short term headline selling. 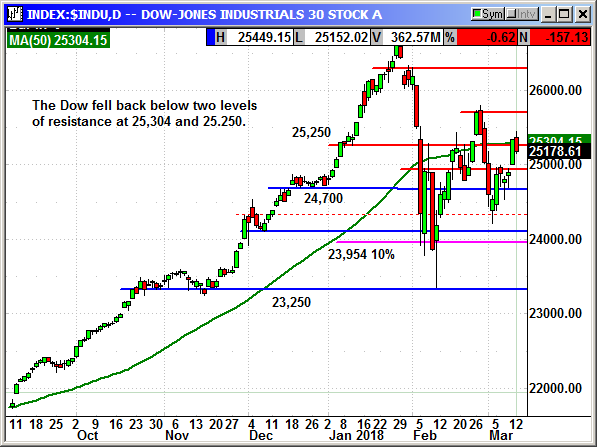 While there may be further retracements as the Dow and S&P try to clear the current resistance highs, the indexes should be higher by early April. 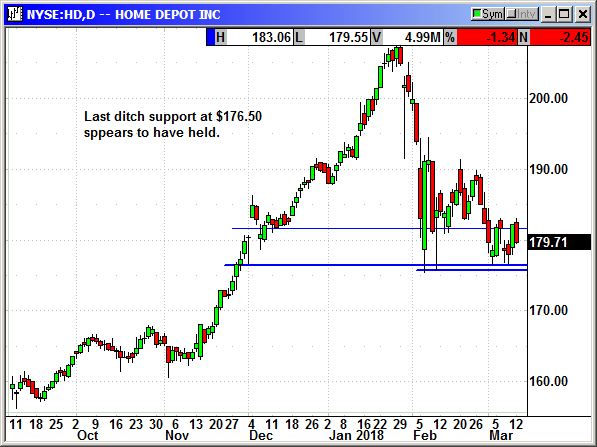 Buy May $165 call, currently $3.70, no initial stop loss with solid support at $156. 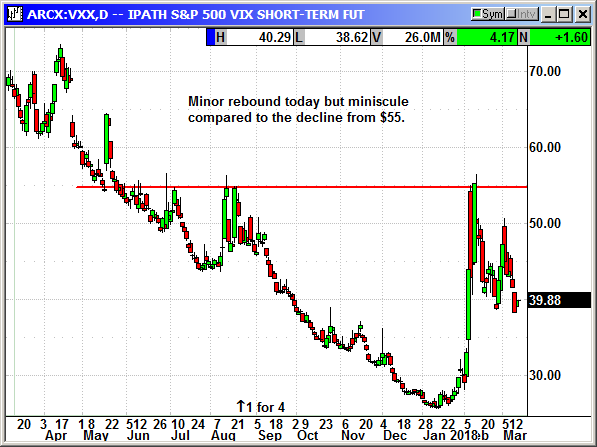 The long call position was reentered on Tuesday. No specific news. Shares were recovering until today when they fell $1 with the market. 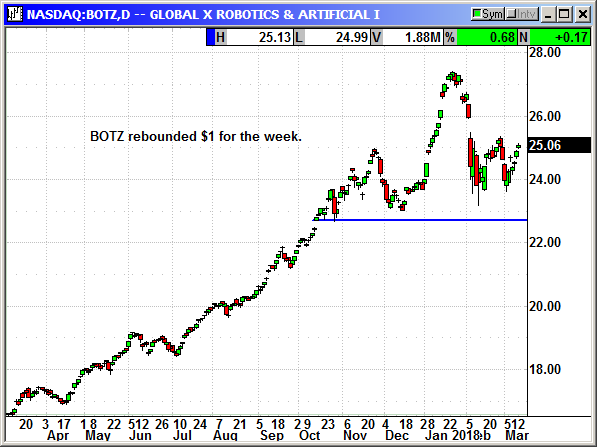 We reentered the BOTZ position at the open on Tuesday. 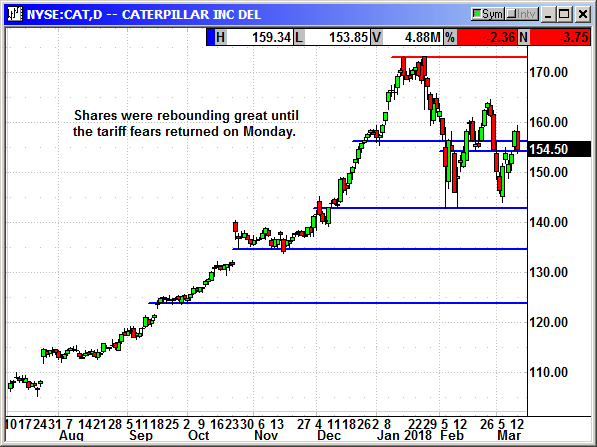 CAT was crushed by the tariff headlines the prior week on worries that other countries could put import tariffs on CAT equipment to offset the proposed steel and aluminum tariffs. We reentered the position on Monday and CAT rallied all week but gave back nearly $4 on Monday as those worried returned. Multiple energy CEOs stressed the expected shortage of LNG by 2025. That is a big plus for Chevron with the two largest LNG plants in Australia with an estimated 100 Tcf of gas reserves to feed them. Nice $3 rebound from our entry point on Tuesday. No specific news. 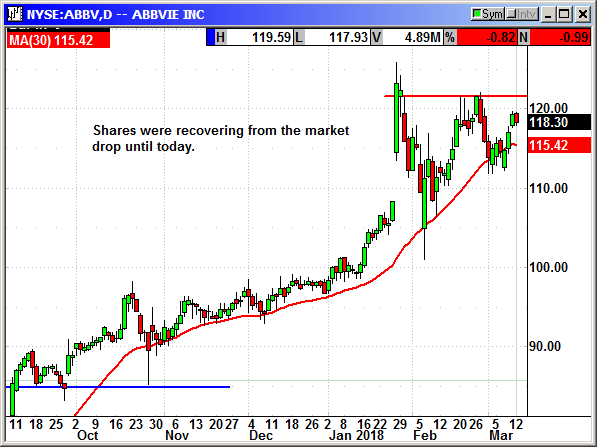 HD shares cannot seem to maintain a trend. 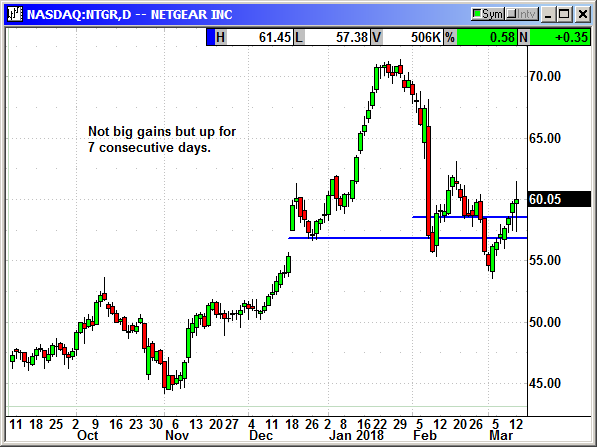 Every big gain is followed by a retracement but at least support is holding. 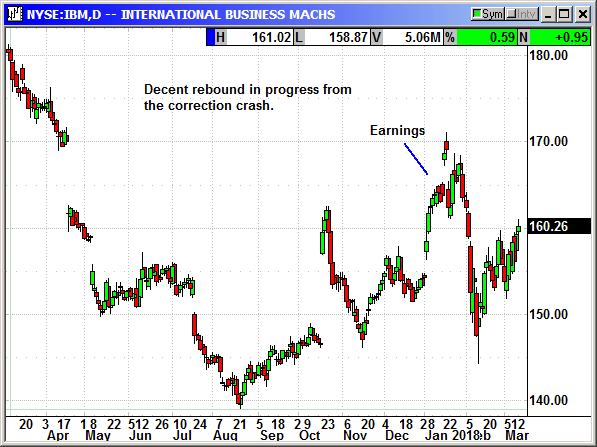 With business strong, shares should eventually rebound once the sellers run out of stock. I considered rolling out of the $190 call and down to the $185 call but it would cost us another $1.50 and i would rather not put more money into this position until a sustained rebound appears. Update 2/26/18: HD reported earnings of $1.69 that beat estimates for $1.61. Revenue rose 7.5% to $23.88 billion and beat estimates for $23.66 billion. Same store sales rose 7.5% and beat estimates for 6.5%. Customer transactions rose 2% with the average check rising 5.5%. Business is good! They guided for the full year for earnings of $9.31 but below estimates for $9.73. Earnings will be impacted by a 19 cent hit from the tax reform. The company is planning on investing a lot in new infrastructure and store remodeling and that will weigh on the full year numbers. Analysts will adjust and investors will return. There was a post earnings decline but shares are starting to recover. No specific news. 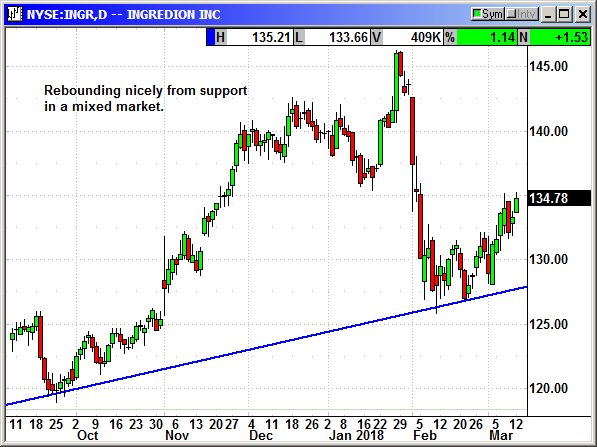 INGR continues to rebound nicely from support. Good relative strength. No specific news. Shares are not moving quickly but they are up 7 consecutive days. I bought a Netgear Nighthawk router over the weekend and it is excellent! Volatility has declined significantly but it is not over. It normally takes 4-5 weeks for volatility to return to normal after a high volatility event and we could have a couple weeks left. The trade war headlines erased a week of declines but this is temporary. The VXX always moves lower.